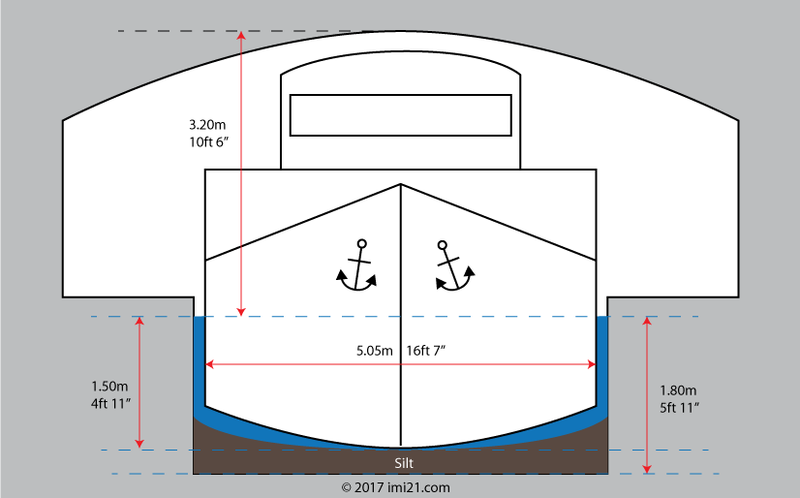 The maximum limits of a boat are indicated below and in red ink on the drawing. The speed limit on the canal is 6 kilometres per hour. You must be respect the lock opening times, and it is illegal to operate the locks yourself, except for certain sections. I.e. If the lock keeper is not at the lock you must wait until he/she arrives before you can prepare the lock. 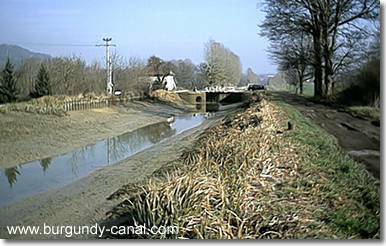 The photographs above shows an empty canal "pound" near Fleurey sur Ouche, you can see the silting of mud. So be careful when passing other boats and do not get too close to the edge. The first barge to pass the tunnel at the summit of the canal was in December 1832. The canal is 242 kilometre long, it is divided into 188 "pounds" (stretches of canal between locks), there are 113 locks on the Yonne side and 76 on the Saône side .The canal is later modernized to the Freycinet standard, accommodating barges and boats up to 38.5 metres long and 5 metres wide, with a draft of 1.80 metres. The average depth of water is now 2.10 metres but take this figure with a pinvh of salt and consider that your draft should be under 1.6metres as there is much silt and mud. The longest "pound" is between lock 13-14 on the Yonne side and is 10.5 kilometres (the depth of water has been lowered is very silted), the shortest 201 metres at lock 37 Yonne in the Marigny stair case. The highest point of the canal is the "partition" at Pouilly en Auxois, it is 378 metres above sea level. The lowest point being at the junction with the river Yonne at 79 metres. The deepest lock is 106-1075 on the Yonne side with a depth of 5 metres, whilst the average is 2.65 metres. Lock number 106-107 used to be two locks, but the made into a single lock. Marigny: Lock 16-55 Yonne, with 39 locks in 13.8 kilometres, average distances of 356 metres between each lock. Vandenesse: Lock 1-11 Saône, with 11 locks in 3.2 kilometres, average 320 metres.